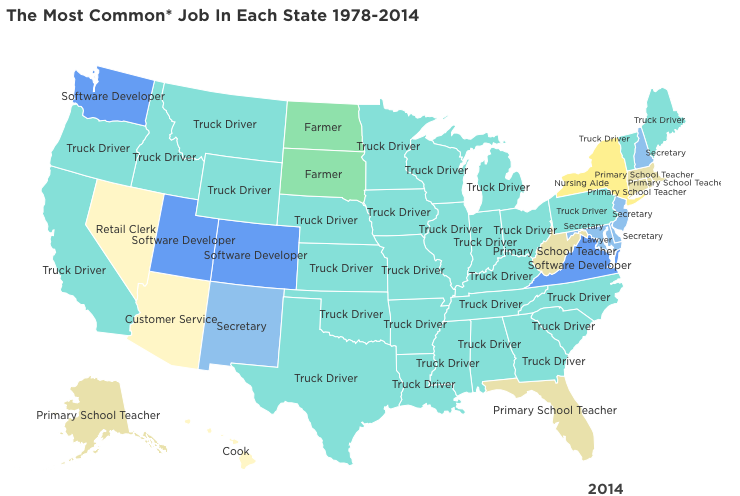 Very interesting historical perspective on the "common job" in each state over time. But what got to me was the dependence on trucking and delivery as an industry, vocation, and owner-driver type of career. How can the US NOT benefit from lower oil prices when so many rely on it as a major necessity and also a liability in their business? The stock market can go do whatever it wants, but consumer confidence is likely to keep on rising as the cost of transport falls, and ALL those truck drivers out there benefit. USA - Keep on Truckin!